This was a small study for possibly a larger painting somewhere down the line. It's based on a photo from my recent trip to Lake Garda in northern Italy. This was a street in a wonderful town called Limone on the northern end of Lake Garda. It had an abundance of bougainvillea - even in late September. The bougainvillea is always a challenging color to capture- -it's not really purple. I tried few combinations on my own that didn't quite get it, but then I referred to my color charts and saw that magenta plu permanent rose plus white came pretty close. 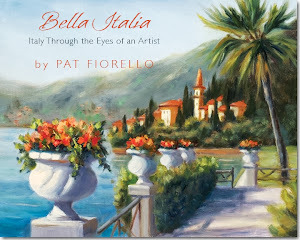 I've been focused on primarily florals and still life's lately while doing my challenge of 50 floral paintings, but do want to get back into some landscapes as well for a new series I'll be working on in 2012 called "Enchanted Italy". I decided to get back in the landscape mode by doing a little "mini" study of a painting I had done in larger from earlier this year. This one was based on some photo's I put together from a trip to Tuscany where we visited the poppy fields. I liked the idea of looking beyond the fields to the villa in the distance. The villa wasn't exactly placed in the right spot, so using artistic license, I moved it to where I wanted it in the composition. If you have always wanted to paint in Tuscany, please contact me at patfiorello@aol.com. I'll be returning for my 5th year to teach another workshop in 2012. Click here for details. I bought this Spode china vase in an antique shop in NJ a few months ago and have wanted to include it in a still life set up. I like the delicate orchids and branch that lead you to the vase. I had a real one for the original set up, but also found a pretty good silk orchid branch at Michaels to use as a "stand in" for future set ups if I don't have real orchids available. Today's study is a simple bouquet of yellows, pinks & whites. Sometimes I just find a color palette I like and then try to get flowers that fit that. This light combination of colors has a soft, romantic feel. With Thanksgiving upon us, it's a good reminder to take time to smell the roses in life- the people, places and things your are grateful for. Thank you for following my blog and sharing what I'm up to with my art. It is a personal joy to make art, but it makes a difference to share it with others too. Hope everyone has a Thanksgiving filled with love and gratitude. Just a little quickie today to work on loose brushstrokes- practice, practice, practice. I bought this beautiful hand made ceramic cup in a small town near Radda in Chianti when I was in Tuscany earlier this year with the intention of using it in still life set ups. I finally got around to taking it out to paint this week. 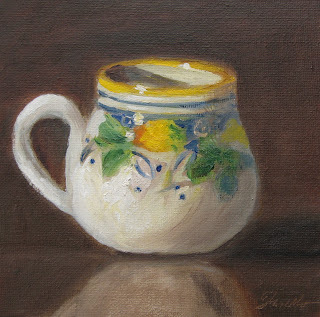 Before arranging a full set up, I thought I'd just start with this small study of the cup without any other elements to get a handle on how to approach it. Since it's a painting of something that's already hand painted I thought it might pose some challenges. It was a lot harder than this little innocent cup looks . The shape is tricky and had to be readjusted several time and I am not sure I ever really got it exactly. The suggestion of the hand painting was actually the easier part compared to trying to capture the overall shape and form. I'm glad I tried it a simple study first before complicating matters even further. Look for it again in some upcoming still life paintings- maybe with some fruit and flowers next time. I was excited to learn that one of my paintings, Sunflower Morning, shown below, was accepted into the "The Best & The Brightest" Show at the Scottsdale Artists School. This is an annual juried show open to anyone who has studied at the school in the past year. I was there earlier this year studying with Hedi Moran. She was wonderful. The show runs from Jan- March 2012. If you happen to be in Scottsdale during that time you might want to check it out. I saw the show this year and there were some really magnificent pieces. The show is pretty competitive to get in so I was honored to have a painting included. 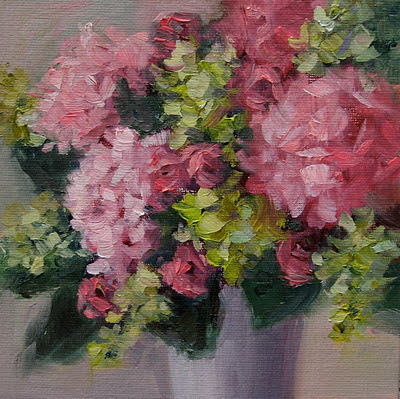 I'm also excited to announce that I will be teaching a new workshop in March 2012 in Atlanta- Painting Flowers " Alla Prima" in oil. Details are listed in the announcement below. Feel free to share with anyone who might be interested. This 2-day workshop will help you to approach painting flowers directly in oil with a loose, fresh, soft approach. 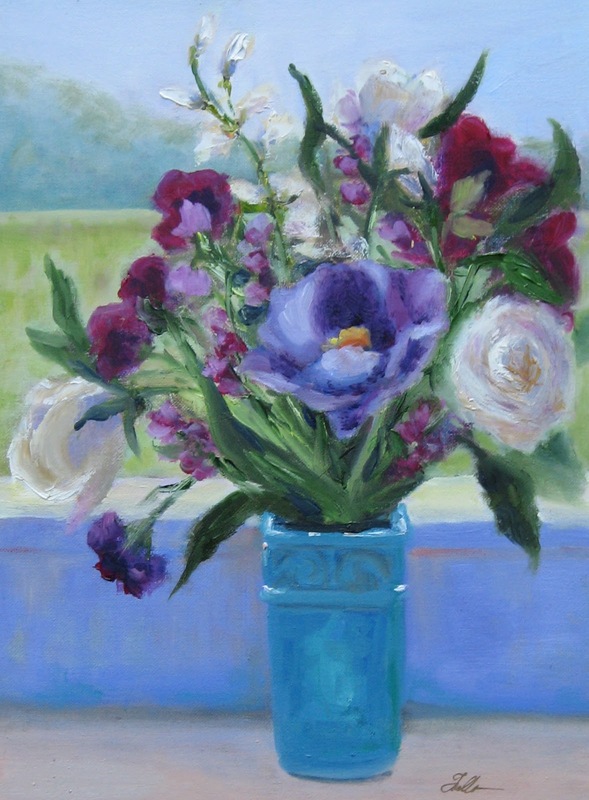 There will be demo’s, studies and instruction (including understanding and simplifying flower shapes and form, and mixing color for flowers and foliage, among other topics) and guidance while you paint from Pat. We will be working from your own fresh flower set-ups. 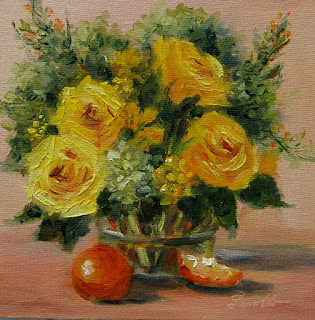 Pat is known for her romantic landscape, garden and floral paintings that have a soft, impressionistic feel. She has had over a dozen solo shows including shows at the State Botanical Garden of Georgia and Callaway Gardens. Passionate about flowers, Pat has studied floral arranging design at the Halls Design School. She teaches painting workshops in the U.S., Caribbean and Europe, including a past workshop at Monet’s Garden in Giverny, France. Supply list to be provided. This is the last of the series of 50 floral studies that I embarked on earlier this summer. This little one I did with a 45 minute timer on as an exercise to keep it simple and not overwork it. All 50 have now been posted on my blog, mostly during Aug- Oct of this year. I actually laid out all 50 in sequence on the floor to see how the paintings had evolved, the experiments I tried and what I had learned along the way. It has been a fun challenge and I am now ready to embark on a new sereis which I'm calling "Fresh from the Garden". The focus will still be flowers and I'll still do some small studies, but will shift more towards some larger pieces for upcoming shows. Stay tuned. I'll share them as I complete new work. I will also be teaching a new 2 day oil painting workshop in Atlanta in 2012- Flowers Alla Prima. For more information see The Art School in Sandy Springs and click on the March calendar. 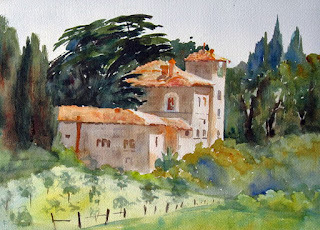 This is a painting of a Villa in a small town called Vagliagli, near where I have been going each year to teach a painting workshop. I typically go in the Spring, but for 2012 I decided to change things up a bit and see Tuscany in the fall. We stay at a beautiful 12th century monastery which has been restored to modern first class lodging accommodations while retaining and old world authenticity. The views are spectacular and we have our own chef who cooks for us in an authentic Tuscan manner, including of course, plenty of vino from the local Chianti Region. The workshop will be October 13-20, 2012. It is open to artists of all mediums and experience levels. Please contact me at patfiorello@aol.com if you are interested joining us for a painting dream vacation. Our home base in Italy San Fedele, not far from Siena. This was a fun little arrangement I painted from my imagination based on keeping within the yellow- orange-green color grouping. As good as it is to work form life, sometimes it's just fun to make something up. We're at #49- one more to go in my 50 Floral Studies Challenge. Starting to get in the holiday spirit, I decided to try a small study of poinsettias.They were harder than I expected and I scraped this down a couple of times before ending up here. Part of the issue was working from a photo that didn't have great light. Maybe once I can get some live poinsettias this season I'll do a set up from life. This is one I've wanted to paint for a long time. I took a photo of these floral arrangement sitting in front of a window in the place I was staying at in Giverny France about 4 years ago. 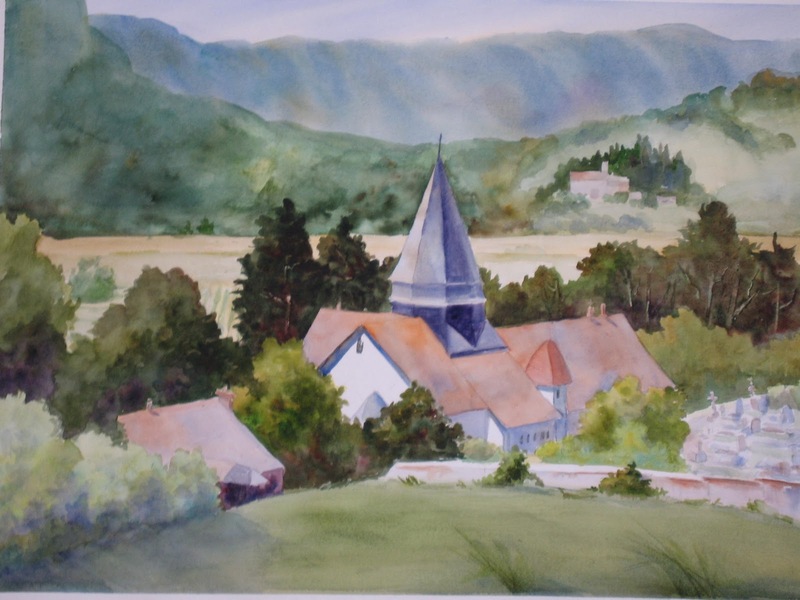 I was teaching a workshop at Monet's Garden and staying a a French country house run by Art Study Giverny. The colors are change from my usual palette. I simplified the background out the window quite a bit from what was really there as I just wanted that as backdrop and atmosphere with the real focus on the flowers particularly the larger purple one. The painting pictured here is one I did inspired by my last trip to France where I taught a workshop at Monet's Garden. I've been mostly focused on teaching in the US and Italy the past few years, but will be making another trip to teach again in France in Summer 2012. This time I'll be going to the Champagne Region and can take up to 7 workshop participants. Artists of all mediums and experience levels are welcome to participate. La Bonne Etoile Artists Retreat. La Bonne Etoile is located 60 miles southeast of Paris, in the small village of Fontaine-Fourches. or contact me directly at patfiorello@aol.com.